'Is it waterproof?' That's a question that's up there with 'what's the battery life?' and 'does it look any good?' that get asked when a new fitness tracker, smartwatch or any supposed swim-friendly wearable for that matter gets announced. Now we're not saying we're all avid swimmers who want to be able to jump in the pool with these shiny new wearables. It's just about getting a clearer picture of what happens when water and wearable collide. The problem is that a lot of companies don't always make that clear. What does IP mean? Is water resistant the same as waterproof? Some do a better job than others of dealing with this issue. If you're still struggling to get to grips with what it all means, we've broken down what those key terms mean and what some of the biggest wearables offer in the waterproofing department. This is the big one and arguably creates the most confusion and can cause some unfortunate owners of wearable devices to find themselves staring down at a broken piece of kit. That's because these are two very different things and there's no clear consensus on the definition of the two terms. Water resistant is regarded as the lowest level of protection and essentially means that something is designed to make it difficult for water to infiltrate. Waterproof should mean that something is impervious to water. The problem is that there's no established industry standard to classify something is waterproof. That's why you tend to see some things labelled waterproof, but it actually isn't. That's why things get tricky. IP - This stands for ingress protection and is a rating system that's set up by the International Electrotechnical Commission (IEC). So you'll usually see this as IP67, IP68 or something similar. It's present to determine two things. The first digit represents its ability to ingress (fend off) solid objects like dust. The second digit relates to its ability to ingress liquid. The higher number, the better the protection your wearable should offer against the kind of things that could really do serious damage. You can check out a chart breaking down the numbers and what the mean here. ATM - This stands for atmospheres and relates to the measurement used in pressure tests. Those atmosphere measurements are translated into water depth to indicate what a device can withstand. So if you have a smartwatch that promises 5ATM waterproofing, it is able to withstand pressure equivalent of 50 metres depth. Pebble's smartwatches are waterproof (water resistant according to the website) up to 5ATM, for example. Water pressure, of course, can vary, particularly when swimming, so while you might see a wearable with an ATM rating, it might not actually be safe for immersion. Devices with a 1ATM or 3ATM rating are not considered swim friendly. It's always to double check on the company's website because these ratings can vary. So you couldn't take the original Apple Watch for a dip, but with the Apple Watch Series 2 and the Series 3 you now get a waterproof rating of 50 metres in salt or fresh water. That means you can go swimming with it in the pool or in the sea with Apple including dedicated pool and open water swim tracking. 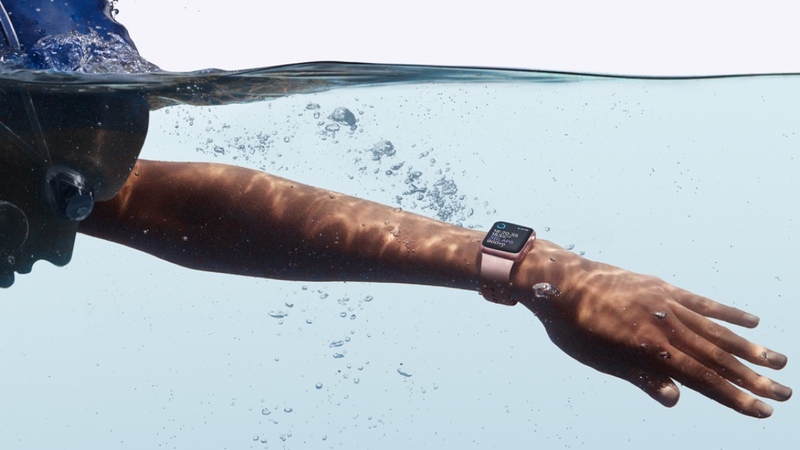 While getting in a few lengths is fine, Apple suggests that it's not fit for "scuba diving, waterskiing, or [in] other activities involving high-velocity water or submersion below shallow depth." So you've been warned. The original Apple Watch offers IPX7 water resistance rating, which according to Apple means it's splash and water resistant. So it's fine for wearing it when you're sweating it out in the gym, caught out in the rain and when you're washing your hands. It's most definitely not waterproof, meaning swimming is off limits. Although this video does suggest otherwise. It appears to prove that the first generation device is actually more waterproof than Apple suggests. To be clear, the Cupertino company advises against submerging the Watch, jumping in a bath with it or even showering with it. Wearing it in a sauna or steam is not advised. Those fancy leather straps won't like being dunked in the water, either. The best selling wearable company has finally decided to add a swim-friendly wearables to its collection. The first was the Fitbit Flex 2, followed up by the Fitbit Ionic and then the most recently the Versa smartwatch. Like the Apple Watch Series 3, it has a waterproof rating of up to 50 metres and can be used in salt and fresh water. That also means there's no problem jumping in the shower with it as well. "We also don't recommend showering with your tracker; though a little water won't hurt the device, wearing it 24/7 does not give your skin a chance to breathe. Whenever you get your tracker wet, dry it thoroughly before putting it back on." The now retired Fitbit Surge is apparently water resistant to 5ATM, but like the other members of the tracker family, it's recommended that you don't go swimming with it. So probably keep this one out of the water. The majority of Wear smartwatches come with an IP67 water resistant rating, which means you can submerge the watch underwater for up to a depth of 1 metre for 30 minutes. Now, that might sound like you can go swimming with it, but you can't. That rating actually means they're not designed for swimming, diving, or prolonged submersion in water. Washing your car or hands is fine, anything else and you're out of luck. It's not all doom and gloom on the Android Wear front for water lovers, though. The excellent Polar M600 is waterproof with an IPX8 certification making it safe for the pool. It has swim tracking features too. The Casio Smart Outdoor Watch WSD-F20 is waterproof up to 50 metres while The Mission by Nixon also comes with a 10ATM waterproof rating so you can go swimming with it up to 100 metres. Even the luxury Tag Heuer Connected Modular 41 is fit for the pool too with a water resistance of up to 50 metres. Garmin has made sure pretty much all of its trackers can be taken in the pool. The Vivosport and Vivofit 4 fitness trackers both bring 5ATM to the table, which means you can go swimming with it at up to 50 metres depth like you can with Pebble smartwatches. It also means you can wear it in the shower. And if you're interested in its army of smartwatches, you can also look at the the likes of Garmin's triathlete-friendly Forerunner 935 or the Fenix 5, which both come with the same 5ATM waterproofing. Are you waiting for a waterproof version of your favourite tracker or smartwatch? Or have any of your wearables met a watery end? Tell us in the comments below.